So in case you haven't heard E.L.F. (Eyes, Lips, Face) Cosmetics is basically a ridiculously cheap makeup brand. Now Lindsey, what do you mean by ridiculously cheap? I'll tell you what I mean! I mean THREE DOLLARS will buy you anything from a brush to an eyeshadow palette. Yeah. So there has to be a catch, right? These products have to be complete garbage! Well.. not really. E.L.F. is a bit of a hit or miss. Some products are indeed, trash (I literally have just thrown things away), but some things are complete treasures! I'm talking need it in your life products! The first of those being the Studio Line Brushes. Do not get the "essential"-- TRASH. "Studio"--TREASURE. The E.L.F. Studio Brushes are unbeatable for the price. I own several of them and for three dollars... you can't go wrong. I would even go so far as to say they are comparable to Real Techniques. I've used these brushes pretty regularly for about a year and washed them countless times. Yes. I said it. It's true. Here are some of the brushes I own! 1. The Stipple Brush- I use this brush to apply my foundation. It works beautifully with any liquid foundation that I use it with and gives me great results. This is a must have brush! 2. The Flawless Concealer Brush- This brush is one of my cannot live without items. I use this everyday to blend out my undereye concealer. It is perfect. You could even use it to conceal other parts of the face. This is a must have brush! 3. The Complexion Brush- I own two of these brushes. One I use for bronzer, which gives lovely results because the brush is pinched at the base. The second I use for powder. I use this with my MAC Mineralize Skinfinish Natural to set my foundation and concealer. It's perfect for this because it's not too dense so you get a nice sheer coverage of powder. This is a must have brush! 4. The Angled Blush Brush- This is a very dense brush, so when applying cheek color a little product goes a long way. I feel like this brush does a good job of blending the color and getting it exactly where I want it. 5. The Small Stipple Brush- I only use this brush to blend out my Maybelline Age Defying Under Eye Concealer in the "Brightening" shade, which I use as a highlight. This blends out my highlight perfectly on my cheekbones, nose, cupids bow and forehead! 6. The Angled Contour Brush- I use this brush for an all over lid color. I also sometimes use it to highlight underneath my brow. 7. The eyeshadow C Brush- I use this to pack color onto specific parts of my eyelid, or on my entire eyelid. It does a great job of picking up and depositing color. 8. The Blush Brush- I have never used this for blush. I use it to apply powder highlighters. For example my NARS "Albatross". It's small enough for me to really get my highlight where I want it. 9. The Contour Brush- I use this brush for my crease, outer corner or inner corner to get a really concentrated placement of color on my eye. People may be skeptical about buying these brushes because it seems too good to be true. I can tell you they are most definitely worth three dollars! But wait... they're cheaper than three dollars. BECAUSE I HAVE A DISCOUNT CODE FOR YOU! If you have a total of at least $20.00 worth of studio line brushes/makeup/etc in your cart this coupon code will take 50% off each item. 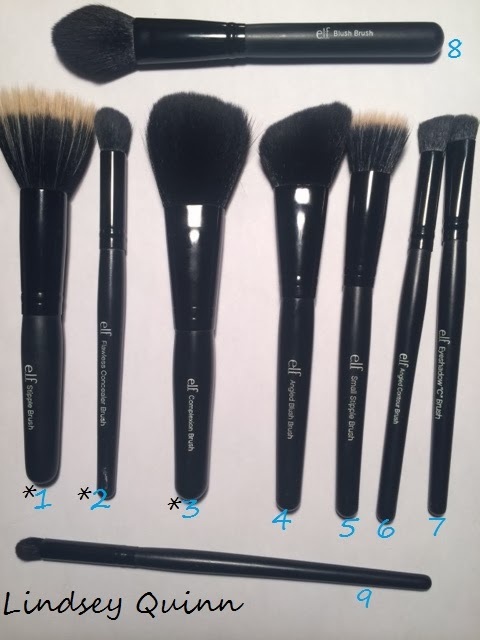 With this code you can get each of these brushes for $1.50. Yes. Believe me these brushes are so worth checking out. And now there's no excuse not to! Thanks for sticking along for the ride! Talk soon! I saw your comment posted on EP. I LOVE makeup and fashion but I learn better hands on. I've watched tons of tuts on YouTube and it hasn't helped me. I need to be with someone to show me how. I do my makeup pretty good I just wish I could learn how to blend two different colored eyeshadows together without making a mess lol. I understand! Hands on is always easier! Blending out eyeshadow can be really tricky! After you've applied all the colors you want on your eye, take a clean fluffy brush and move in small circles over the areas you want blended. You do not want to use a dense brush! I hope that this was somewhat helpful to you!